The Sidi Gavia Gore-Tex boot is Sidi’s best street waterproof boot… and I should qualify that statement to say “best non-heavily armored” street boot. We offer several styles that are taller and/or more robust for sole thickness and armor than this new Gavia, but this boot is designed for street riders rather than adventure or dual sport use. 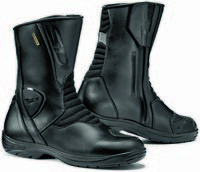 The boot is aimed at those who ride extensively and who want a great quality boot that is waterproof also…. and made waterproof with only the best, most functional materials. The overall quality of construction of the Gavia is on par with other Sidi boots… which is to say, very high, What makes this boot “better” is the use of genuine Gore-Tex as the waterproof breathable liner. Gore-Tex is the premier brand-name product for waterproof/breathable barriers. Gore-Tex has standards and restrictions on the use of their products which necessitates adherence to their own construction standards. Note on the boot upper material: Sidi’s product line has largely been, in one form or another, made of synthetic leather for many years. The use of synthetic materials has become a standard in the motorcycle boot business because of the boot’s ability to resist abrasion, hold up to water exposure, etc. In the marketing materials for this new boot, they reference “full grain” microfiber, so I had to ask for clarification as to what was going on. Here is the reply: “The Full Grain Microfiber still has the original Microfiber (Techno-micro) but is as close to leather as they can get in a man-made material, the feel and look is more supple and leather-like, that is why they call it Full Grain”. I do agree, the material is a notch better in pliability and surface feel than the material on other Sidi boots, however, I think “full grain” is an unfortunate choice of words.